Depends who is doing the PPI. By and large, though, it's a comprehensive inspection to make sure that the car checks out. My buddy does PPIs in San Diego. He looks at everything -- from exterior (and possible paintwork) to engine. I would not do it. Not being a private sale with those type of modifications, and no service records proves a huge risk. If I ever buy a modified car, I'd like to be able to gauge the previous owner myself. I feel the exact same way. Mods aren't always a red flag if you can meet the PO and get a feel for who they were as an enthusiast. It's kind of a toss up for me when it comes to mods. I mean, I have seen some people beat the poo out of some cars and them being stock their whole life. Seems like it was just some bolt-ons but I would really need to check it out to see if there were more things done to it. I think I would rather see a car that has a couple small mods rather than a car with small scrapes and dings and crappy interiors. IMO, the person with the mods prob took care of the car more than the careless person with all the scrapes and stuff might of not given the extra effort to keep up with the car. I found this gem also. More desirable alcantara int. but less desirable red ext. Last edited by Nomar06; 12-12-2010 at 03:42 PM. IMO, the person with the mods prob took care of the car more than the careless person with all the scrapes and stuff might of not given the extra effort to keep up with the car. careful saying the imola red exterior is less desirable! 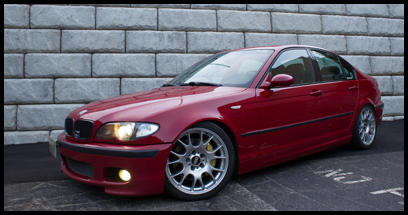 Imola red was only offered on m3's and zhp's. It is actually a desirable color for a lot of people. That second car you posted, on the surface, does not seem too bad. I think Nomar was just saying less desirable to him. We all know that imola red is the best color on the planet. No question there. Haha.... And still waiting for dane to chime in.... Dane, where are you? You guys have a jaded view of this topic! We all know that imola red is the best color on the planet. No question there. Correct....Alpine White is at the top of my list but Imola is not that far down the list either. i think you should think about something in the grey spectrum. Looks hot with black carbon fiber roundels and black out grills.